This leather holster, with sewn on cartridge loops is designed for the outdoorsman that wants his gun and cartridges all in one package. The Loaded Pancake leather holster shares many of the same design features as the Sourdough, we just took another Roy Baker Idea and applied it to our heavy duty pancakes. This is a very practical style for single action revolvers. As you can see in some of the pictures we have made some double row versions on 7.5" barreled and longer revolvers. Use our Contact Page for a quote and to ensure that it is feasible on your Loaded Pancake. 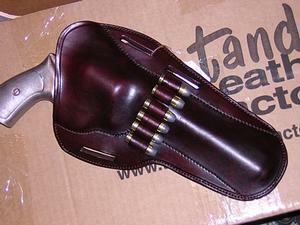 “Inside The Waistband Straps” DO NOT work with this holster. This holster is not a good choice for concealed carry. The Sourdough Pancake is the best choice for concealed carry with a spare ammo pouch. We don’t offer the Loaded for .22LR/Mag pistols. We do make a superior ammo pouch called the Most Versatile that will hold 2 10×22 cartridge Quick strips by Tuff Products. The allow for a rather speedy 2 x 2 x 2 reload and holds all of your ammo in one easy to hold group. If you do not see your exact gun model and/or barrel length, please choose the closest model and type in the exact gun model and barrel length during check out. Before selecting "Other" contact us. NOTE: Floral or Celtic knot carving does not work well with black or oxblood. Fishscale is not available with Celtic carving. Border stamping does not complement Floral carving.